Forum Index > Historical Arms Talk > Hilt Designs define which edge is the "long one"
Posted: Tue 02 May, 2017 7:41 am Post subject: Hilt Designs define which edge is the "long one"
Hi Everyone - this is my first post so firstly accept my apologies if it is in the wrong section or their is some other "problem". I am researching the history of swords in the medieval period of Europe. I came across a post online that mentioned that "hilt designs define which edge is the long edge". Also - I have seen images that have the hilt off-centre so that it aligns with one edge of the blade and so leaving a larger gap with the other edge of the blade (rather than being central). 1. Are hilts sometimes designed in such a way as to define the long edge? 2. If so (to 1. above) then how does the design do this? What is unique about the design? 3. 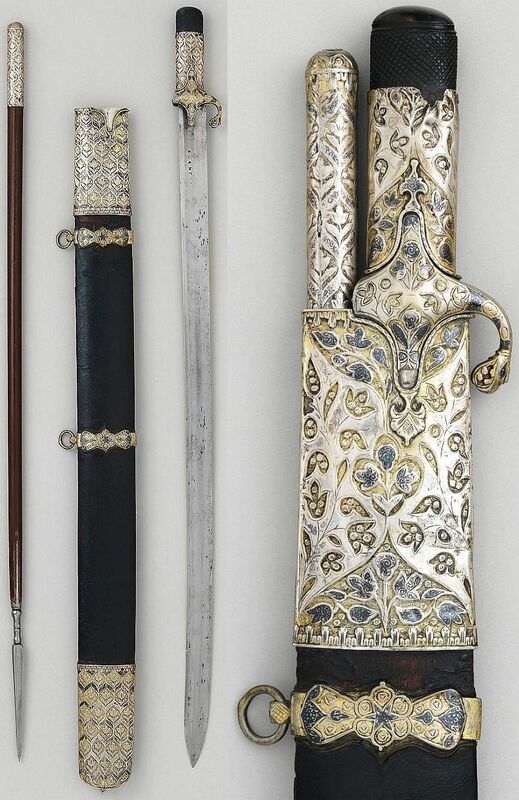 When hilts are off-centre so that the handle lines up with one edge of the blade then is this an example of the hilt design defining the long edge of the sword? 4. If the handle/hilt is aligned with one edge of the blade (so that it is off-centre) then does this also indicate how to hold the sword? Some of these questions are a bit unclear - it would help a lot to have a diagram or picture of the sort of sword you're referring to. However, I'll take a quick crack at a few of these questions anyway. Long edge (true edge, front edge, sharp edge, etc): when you hold the sword, this is the edge which is forward, aligned with your knuckles etc. Some sources call it the long edge, others call it the true edge. Systems designed for single-edged blades may call this the sharp edge. Short edge (false edge, back edge, blunt edge, etc): this is the other edge, aligned with your forearm. When you're holding a sword in your right hand, the 'outside' is the side by the back of your hand, the 'inside' is the other side. If you're looking at the short edge, the outside is to your right, and the inside is to your left. A left-hander will reverse these definitions. For a wholly symmetric sword, which edge is which is just denoted by how you're holding it at that moment. Grab onto the sword from the other side, and you'll switch the edges around. Obviously, if the blade is asymmetric, this will tend to mean that there is a defined long edge and short edge. Typically if one edge is fully sharpened, and the other is only partially sharpened, the fully sharpened edge will be used as the long edge. 1. If the hilt has inner/outer features (e.g., it has a ring or nagel on the outside) then the long edge will generally be set by those. In this case, a left-handed fencer would tend to use the sword with the other edge forwards. However, in this sort of case there's nothing directly preventing you using the sword 'backwards'. Generally if the two sides are differently protected, there will be more protection on what's intended as the outside. 2. If the hilt has bars along the front (such as a knucklebow or basket hilt) then the long edge will be enforced by them. In this case you simply can't use the sword the other way, as these bars will get in your way. So a Scottish basket-hilt will have the long edge set by the presence of a basket. It's not uncommon for a sword to have several of these features. A typical 'Polish sabre', for example, has an asymmetric blade (with only a partial cutting edge on the 'short edge'), a knucklebow, and a thumb ring on the inside. Just to add: many "symmetric" hilts aren't. They're close to symmetric, but they're not symmetric. Sometimes, they're more comfortable one way, but can still be held the other way around. In this case, the ergonomics defines long-vs-short edge. This is independent of the symmetry of how the blade is relative to the hilt. 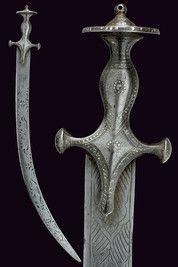 Sometimes these have curved and/or single-edged blades, so there is no question of long-vs-short, and usually the hilt is the right way around (the wrong-way hilts are probably incorrect re-fitting after the weapon's working life). 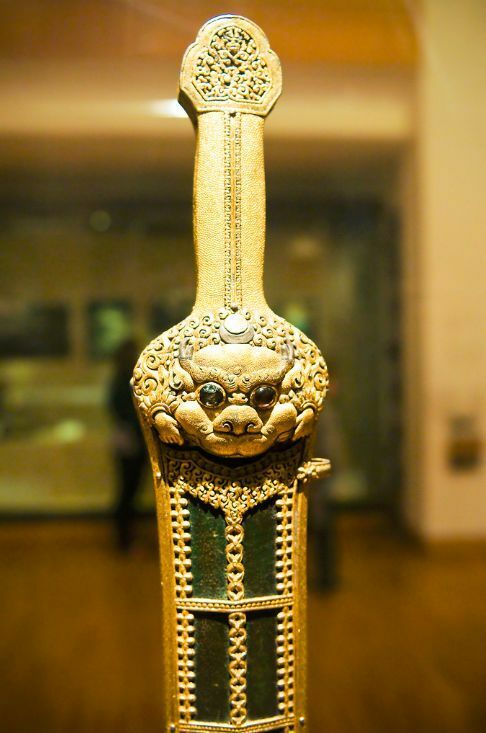 I have seen examples (non-European) of "symmetric" hilts with a clear visual asymmetry (sometimes small enough that you can easily miss it at first glance, but if you're looking for it, it's obvious). At least partly, this might be to let the user see which way around it should sit in the scabbard (the blades aren't exactly symmetric either, and will sit better in the scabbard one way than the other). But having a defined orientation in the scabbard will give a defined long edge when you draw it. These are on single-edged swords, but the same kind of hilt can be found with double-edged straight blades. While it looks symmetric, the difference between the two orientations is easily felt. The blade is single-edged (like these knives), and the comfortable way to hold it has the edge on the correct side. With a double-edged blade, it would be easily usable both ways, but the better comfort would mean I would preferentially use it only one way. I pretty much agree with Tea. I don't think anybody really remembers why one edge is called short and the other is called long even on a symmetrical weapon, this nomenclature was probably old when it was first recorded. I can remember when I was a kid we commonly called the edges of your clip point knives long and short, we always assumed that was because the sharped portion of the clip point was short but we were probably just echoing terminology that had been in use for a great many centuries. Anyway the most plausible explanation I've ever heard is if you hold your sword straight out in front of you with the long edge down you really do have a little more reach than if you rotate your hand to have your short edge down.